This special Holiday Sale bundle includes everything you need to start playing electric guitar! 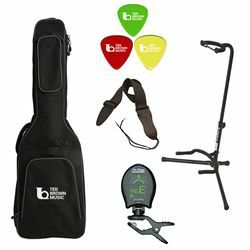 Includes an instructional DVD, tuner, gig bag, strap and stand. A perfect complement to your new electric guitar and amp! Acoustic, classical and bass guitar packs are also available.